After our move, we were lucky enough to never encounter bedbugs in our new apartment. It seemed that the combination of cleaning, washing, chemicals and car heat did the trick. We still stayed extremely vigilant throughout the first months, since even with one egg we could potentially start a new colony. We continued using our steam iron on our bed and couches, and changed our sheets often enough to be able to inspect the mattress. The emotional toll and probable PTSD we both encountered during and after this horrible experience lead us to change parts of our lifestyle. On my part, I had to stop all caffeine intake. I noticed that having caffeine in the form of coffee, soda or even tea made me itchy in the evening, leading to insomnia because I had the constant feeling things were crawling all over me. My partner ended up using the steam from our iron every evening on our mattress for months during and after the ordeal was done. We both became very careful when we changed our bed sheets and were quite paranoid with who came to our home. We are almost sure that a friend who had done laundry in our apartment for multiple days brought them. We never let anyone do laundry at our place again. It seems like the story is over isn’t it? Well it’s not. My bad luck seemed to stretch for months after. It was my 25th birthday and I had organized a trip to Austin. I had gotten a cheap hotel not too far from the party area and our friends. When I walked into the room, I undid all the mattresses and checked all of the sheets. I looked for black stains on the covers and comforters, I undid the fitted sheets and checked the mattress corners for any signs of black sports, I looked in the night tables and headboards but couldn’t find any issue with the beds so I slept very well. The only problem is that, the morning came, I opened my eyes, and what did I see crawling on my sheet right before my eyes? A BEDBUG! At that point I was done with the issue. I couldn’t stand it. I killed the nuisance, furious, brought it downstairs to the lobby and was ready to make a scene. When I told the clerks, all I got was a “I’m so very sorry for the inconvenience would you like to change rooms?” By that point I told them very politely that I required them to cancel and refund my entire stay; and not to forget to dry all of my clothing and put them in a plastic bag. Truthfully if they had declined my offer, I would have gone to social media to bring attention and to write a review of the hotel stating they had bedbugs. Thankfully, they did exactly as I demanded, even though it took them half the day to get everything approved. They needed to get in contact with their manager who wasn’t in for the morning to approve the refund. I called the front desk about every two hours to check on the status of my refund while looking for another hotel. I have to admit, the stress of encountering the bug again really ruined my day and the fear of bringing some back to our new apartment was constant. We left all of our luggage in my car and right as we got home, everything went into the washer as quickly as we could manage it; don’t stop by go, don’t collect 200. The Bedbug issue is a real thing. It will drive people mad and paranoid, and even then, even with the ensuing paranoia, staying in hotels seems to still be dangerous. I checked every possible sign of bugs in my hotel and still ended up having some. I am now very precocious of hotels; I don’t only check the bedding, I make sure I put my suitcase in the bathroom, where the bugs don’t typically reside, I wash everything and steam my luggage the moment I get home and I never assume there are no bugs. Better be safe than sorry, the saying says, and I agree with that. I’m so glad I got help from Dogscan to work through the issues and make me feel like I wasn’t alone in the mess. I now know how to be proactive about the issue, and if I ever encounter it again, I will know exactly how to react and what I am facing. 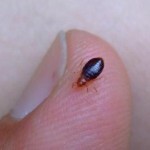 One of the most difficult parts of the bedbug problem is that we typically do not know how to get rid of them, and with a clear plan and a great potential for success, that doubt is seriously diminished and we can focus on the tasks at hand : preparing as best we can for the exterminators to be able to do an efficient job.